There were 646 deceased heart beating cases (possible donors) reported to Saudi Center for Organ Transplantation this year from 104 hospitals with intensive care units. 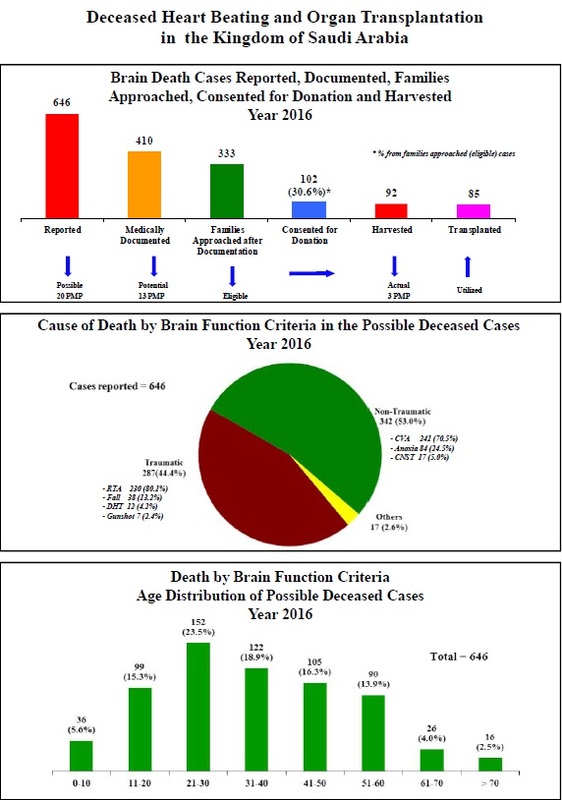 Of this total, 410 cases (63.5%) were fully documented to have irreversible neurologic determination of death (potential donors) according to our National Protocol. 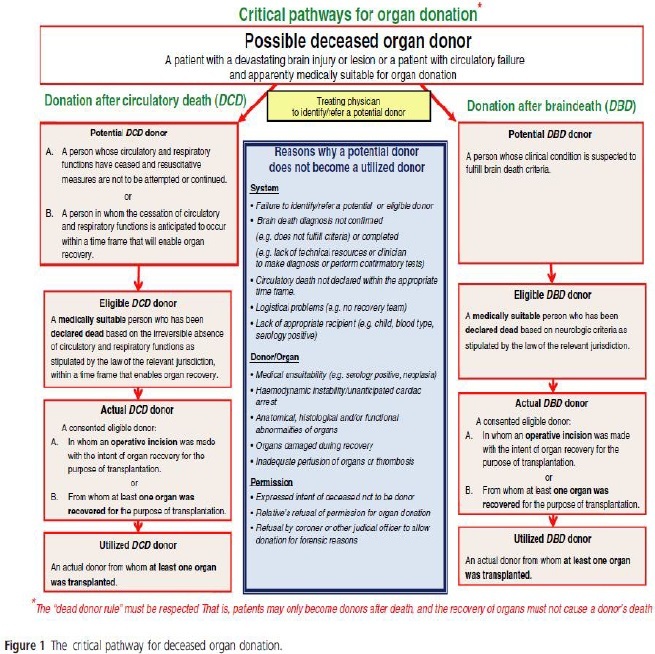 Families were approached in 81.2% of the potenetial donors (333 cases), and consent for organ donation was obtained in 102 cases (30.6% of all diagnosed and approached cases where the families could be contacted and the issue of donation was discussed). On the other hand, family refusal to donate organs constituted 69.1% of the family approached cases. Out of the 102consented cases, organs of 92 cases (90.2%) were successfully harvested (actual) during this year. 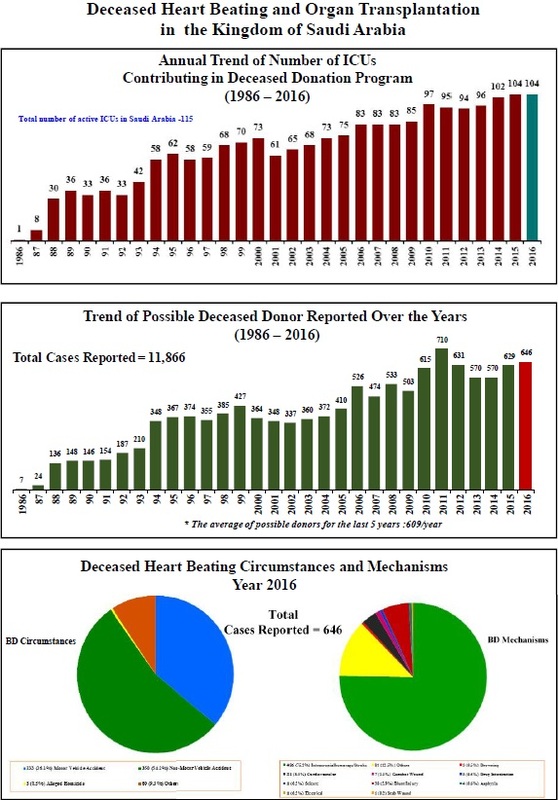 Regarding organ transplant activities, there were 125 kidneys transplanted this year from deceased donors (distributed between 10 governmental transplant centers). Sixty nine deceased livers were also transplanted this year; 27 at King Abdulaziz Medical City (NGH)-Riyadh, 24 at King Faisal Specialist Hospital-Riyadh (6 of them as split livers), and 18 at King Fahd Specialist Hospital-Dammam. Beside that, 29 whole hearts were transpalnted inside the Kingdom this year in addition to 9 hearts retrieved to be used as source of human valves. 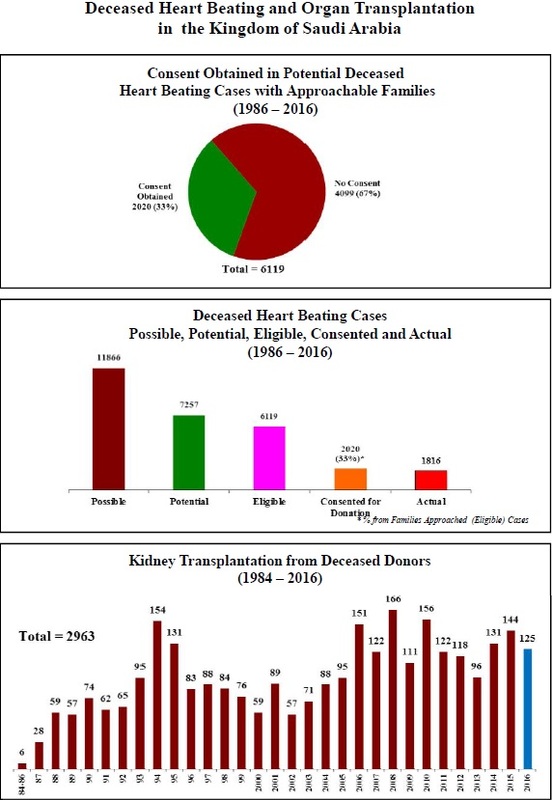 Other organs' transnsplantation actvities showed that one single lung, 30 double lung and 11 pancreas were transplanted this yearin addition to retrieval of 61 bones and 12 multiskeletal tissues. The performance of corneal transplantations in the Kingdom reflects the continuous dependence on corneas harvested abroad. In this year no corneas were harvested locally from deceased donors. 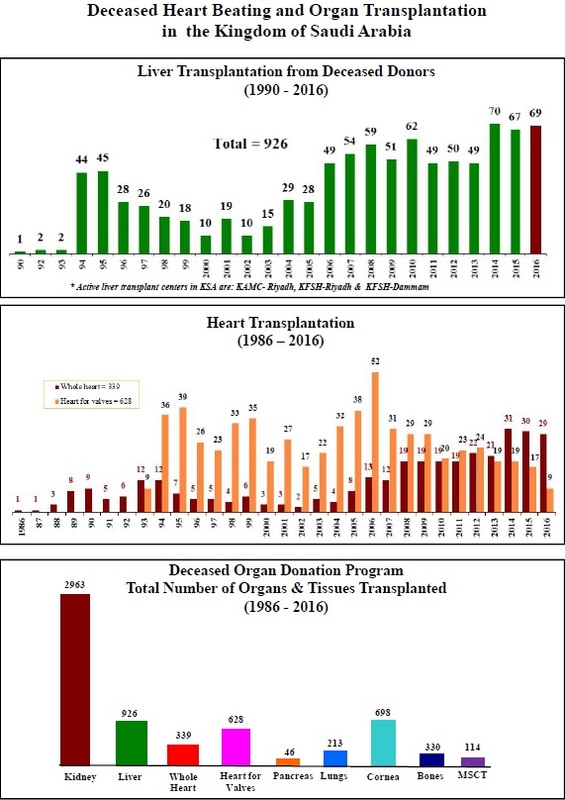 In conclusion, despite the achievements realized, (number of deceased heart beating cases reported, number consented, number harvested and number of organs transplanted/utilized), more efforts, through diffent media outlets, are still needed in order to boost the organ donation and transplantation activities in the Kingdom. Stress on health education to the medical community and increasing public awarnessabout the importance of deceased organ donation and transplantation should still be continued.